Avoiding the anthem avoids the associated political controversy. The anthem is a largely symbolic gesture in sports all over the world. If it's going to be politically polarizing, it should be avoided entirely. If the players' contract says stand, they are on the clock, and they should honor the contract and stand. Not coming out for the anthem would take away the attention from the players that are protesting. 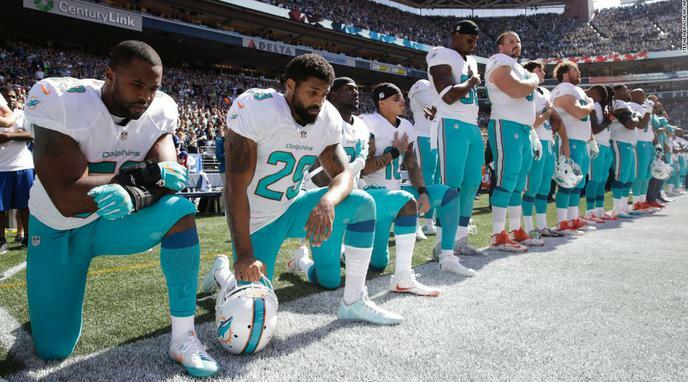 If they want to protest then they should be on the field so people can see them. Avoiding the topic entirely is dismissive of the valid concerns of players protesting racial injustice. Refusing to take a stand is implicit acceptance of the status quo. If the status quo is unjust, then inaction is complicit in injustice. Avoiding the anthem can be viewed as a political statement in and of itself.